Each March, SXSW transforms Austin into a buzz of innovation with professionals from all industries, from around the globe. Founded in 1987, attendance at official 2018 SXSW events approached 289,000 people and SXSW’s economic impact on the Austin economy was $350.6 million. SXSW includes a series of festivals on the topics of film, music, interactive, comedy, gaming and education (EDU). As part of the crowd, Jewish thought leaders and artists from the United States, Israel and many other countries contributed a Jewish perspective to the events. This year, SXSW 2019 kicked off with SXSW EDU Conference and Festival, held March 4 through 7, offering educators an opportunity to learn, connect and discover. Jinnie Spiegler, Anti-Defamation League director of curriculum, and Libby Otto, ADL associate director of curriculum, discussed “From Headline to Homework: Teaching Current Events.” They pointed out that young people hear about controversial issues in the news constantly, and that they want to and should be part of the conversation. Using ADL’s anti-bias framework, interactive strategies, and curriculum content about current events, Spiegler and Otto encouraged session participants to gain confidence and skills to turn teachable moments into enriching classroom conversations. In “Teaching Social Justice Through Art,” Jillian Bontke, ADL Austin education director, and Sabrina Phillips, museum educator, school and teacher programs at the Blanton Museum of Art, talked about how art can bridge conversations that address bias, race, inequity and membership. They equipped session participants with tools to facilitate classroom conversations about racial bias, immigration, mental health and being an ally. "We are honored to be a part of a conference that cultivates and empowers educators and stakeholders to advance teaching and learning," said Bontke. "Getting to share ADL's educational and anti-bias resources with teachers helps to ensure that they can better inspire advocacy and allyship in students. We want all learners thinking critically about what injustice looks like or sounds like or feels like, and then we want them ready to act as a confronter and an ally and stand up to that hate or injustice." She added, "Educators are often delighted and surprised by the amount of online lesson plans, discussion guides, book suggestions and activity ideas we provide for free online. We try to make ideas and best practices related to teaching about social justice super accessible and user friendly for educators. At all three sessions this year educators left excited to have found new free online resources to use in the classroom." Former ADL staff members Rachelle Warren, director of social and emotional learning and multi-tiered systems of support in Belton Independent School District, and Melia Dunn, founder of Melia Dunn Consulting, used ADL resources to build their panel, “Let’s Get Real: A Primer for Allies.” They explained important considerations that should precede ally-ship through interactive group discussions and personal reflection, and encouraged participants to leave with strategies to operationalize advocacy. ADL continued to make an impact during SXSW Interactive Festival, held March 8 through 12. Adam Neufeld, ADL vice president of innovation and strategy, and Vidhya Ramalingam, founder of Moonshot CVE, discussed “Disrupting extremism: New tools to fight hate,” detailing what can be done to protect online spaces from abuse by extremists. 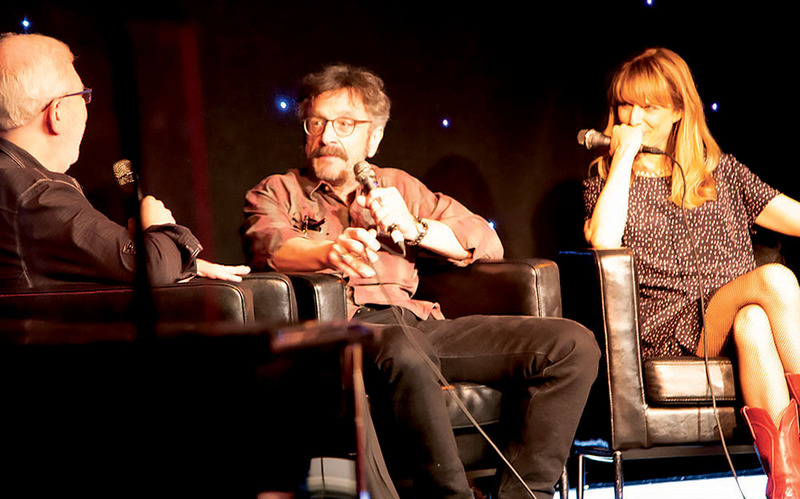 During SXSW Comedy, film critic Leonard Maltin (left) and his daughter Jessie Maltin sit down with actor Marc Maron (center) and director Lynn Shelton (right) to discuss their new film "Sword of Trust." Credit: Wendy Goodman. The long tradition of humor in Jewish culture was also evident at SXSW. Author Neil Gaiman discussed adapting his book, “Good Omens,” into a heavily promoted upcoming Amazon Prime show, as part of a March 9 panel that included director Douglas Mackinnon, cast members Michael Sheen, David Tennant and Jon Hamm, and panel moderator Aisha Tyler. Fans packed Zach Theatre March 10 for a screening of the final three episodes of “Broad City,” a Comedy Central series created by, written by and starring Abbi Jacobson and Ilana Glazer. Jacobson and Glazer sat down with Kent Alterman, Comedy Central president, for a Q&A after the screening. The feature documentary “It Started as a Joke,” which premiered at the SXSW Film Festival on March 10 at Zach Theatre, chronicled the decade-long run of the Eugene Mirman Comedy Festival, examining Mirman’s unique sense of humor, his role in the alternative comedy movement and—as the festival came to an end in the midst of Mirman’s wife’s battle with terminal cancer—reminded viewers of the healing properties of comedy. On March 9 at Esther’s Follies, famed film critic Leonard Maltin and his daughter Jessie Maltin moderated a hilarious discussion and podcast recording with Marc Maron, actor, and Lynn Shelton, director, on their new dramatic comedy "Sword of Trust," which premiered at SXSW. Shelton selected the film cast with proven acting chops to improvise the entire dialogue about a pawn shop owner played by Maron vying to make profit by selling a Civil War-era sword. Maron described how he honed some of his improv skills while working with Shelton, listening to direction and collaborating with a talented group of actors. “I do operate sometimes on one kind of persistent, intense, emotional level. It’s slightly angry, and sometimes that’s not what’s called for. I had to learn that, because it’s not my instinct,” Maron explained. Shelton praised the work of the actors and how Maron stretched himself to achieve an outstanding performance. “You want to give these brilliant actors a certain amount of freedom so they can really contribute. There’s so much in there that I could never come up with on my own,” Shelton said. Shelton shared her inspiration and how she tapped into her own improv acting roots to create the improvisational movie she always wanted to. “This is my eighth film, and all of my previous seven films I was so hell-bent on it being real at every turn even if something unexpected happened, it needed to be something believable,” Shelton told the crowd. Maron is a Jewish stand-up comedian, actor, writer and podcaster from New Jersey who also collaborated with Shelton on the Netflix series "GLOW." For the fifth year in a row as an official SXSW event, the Oy Vey! music showcase took the festival by storm with an exclusive mix of musical acts from all over the world, some making their SXSW debut. Jewish rapper Kosha Dillz, né Rami Even-Esh, created Oy Vey! to bring Jewish and non-Jewish musicians together for a show that SXSW goers can’t hear anywhere else. “At that point, I had a lot of money and wanted to make an impact quickly so I made some big decisions to do a show, and we ended up with eclectic acts from all over the world to create Oy Vey!,” Kosha Dillz said. As part of this global showcase, Tel Aviv-based indie rock band Bones Garage commanded the stage with a thrilling performance of deep ballads and hard-hitting riffs. Their SXSW tour continued at Dirty Dog Bar March 13 and Pearl Street Co-Op March 16. The members of Bones Garage come from many different backgrounds. This polyglot mix of cultures combines to inspire their rock music. The ambient electric-infused hip-hop sounds of ORI filled the room following a set by electro-pop duo There. In his SXSW debut, ORI took his seat on stage with a keyboard, mic and beat maker as the crowd gathered closer to witness and dance to his smooth beats and poetic lyrics. Kosha Dillz joined on stage with a smooth-flowing freestyle over one of ORI’s beats for a powerful duet. As a Jerusalem-born musician, now based in Berlin, ORI finds influences from his background and cultural upbringing. The Oy Vey! lineup also included Phony Ppl, Gangsta Boo, Kosha Dillz, Dillon Cooper, Jabee, Noa James, Vincint, Lyons & Co., JonZ, There, Fragile Rock and Ben Buck. Oy Vey! was presented by Kosha Dillz and JSwipe, and supported by Shalom Austin and Adam Swig, Culture FWD. For more SXSW Music coverage, interview with Jewish rapper Kosha Dillz on the Oy Vey! music showcase, and interview with Israeli band JonZ, check out page 50. SXSW goers had the opportunity to unplug, network and observe Shabbat at two unforgettable communual gatherings that bookended the festival. 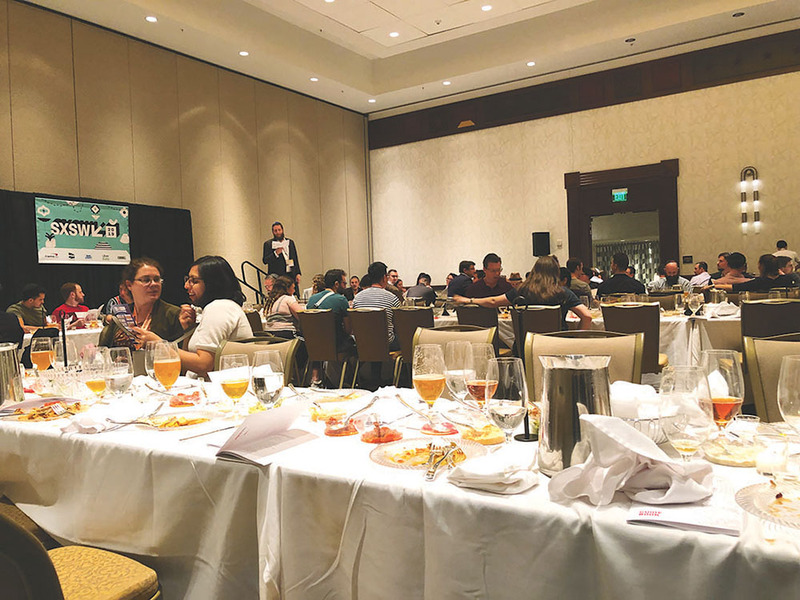 On March 8, Chana and Rabbi Mordechai Lightstone of Tech Tribe, a Brooklyn-based networking group for Jewish professionals in tech and digital media, and an affiliate of Chabad Young Professionals International kicked off SXSW with #openShabbat at the Hilton. Rabbi Lightstone led an interactive service over dinner with a packed room of Jewish locals and visitors from around the world. Rapper Kosha Dillz closed out the evening with a freestyle rap. #openShabbat was made possible with the help of Schusterman Family Foundation, OneTable and OurCrowd. The final Friday at SXSW brought an excited crowd to Empire Control Room in downtown Austin for the second annual Empire Shabbat party on March 15. Complete with candle lighting, challah, pizza, music from DJ Amuse and indie-folk duo JonZ, freestyle rapping by Kosha Dillz, and plenty of schmoozing, this Shabbat observance was like no other. San Francisco-based promoter Adam Swig, along with Kosha Dillz and Open Table created and hosted the event with support from Angel Events, Shalom Austin, Reboot, Shabbat Tent, Girl at a Rock Show, and At The Well. Swig explained the goal of Empire Shabbat is to bring visitors and locals together during SXSW for a unique community Shabbat experience. Before sundown, JonZ played a lively acoustic set before Kosha Dillz joined them on the mic for an impromptu freestyle jam while DJ Amuse beatboxed, and the crowd cheered them on in what was a high point of the evening. Following the reciting of the Shabbat blessings and candle lighting, the crowd passed around loaves of challah, breaking bread together like family. Kosha Dillz’s freestyle finale involved audience participation using items from the crowd for inspiration for his on-the-spot lyrics. “Shout out to the challah bread, the pickles and the beatbox. This all is underground. Right now, there’s an enormous tree in the background. I’m representing for flow like it’s on fire. So make some noise for Shabbat at Empire,” rhymed Kosha Dillz. The Jews in Tech Meetup, hosted by Chana and Rabbi Mordechai Lightstone, gave Jewish professionals from the tech industry an opportunity to connect. A group of 20 to 25 men and women got together March 11 and discussed Jewish identity and anti-Semitism in the workplace. "The world of tech has grown exponentially, making its way over the past few years from a niche interest to the pulse of modern society. It's critical that as technology continues to grow and evolve, those leading the way tap into a deeper understanding of the positive and negative potentials technological innovation offers,” said Rabbi Mordechai Lightstone. “We want to empower young Jews in this space to act as agents of change and light in their own lives - and SXSW is the ideal venue to make that happen," he said. Howard Schultz, former chairman and CEO of Starbucks and prospective Independent presidential candidate, made an appearance at SXSW this year. During his talk, moderated by Dylan Byers of NBC News and MSNBC, Schultz spoke about the two political extremes between the Democrat and Republican parties that has developed in the United States and how he is seeking the progressive middle ground. “I said publically that I was seriously considering running for president as a Centrist Independent outside of the two-party system. And I said that because, over the course of the last year as I’ve examined and traveled the country, I began to realize that the challenges and the problems facing the American people, the fracturing of trust and confidence in leadership and in government is not just because of one party or just because of lack of dignity and respect and character of this president. But I’ve come to the conclusion that the two-party system, for all too long now, is broken and the level of dysfunction and polarization and revenge politics has reached a level in which I think we are on the clock as a country,” Schultz explained. While answering questions from the audience during the last half of the interview, Schultz brought up a common question he often receives. “Is the country ready for a Jewish president? I think the country is ready for a Jewish president. I’m not running as someone who is Jewish. If I run for president, I’m running as an American who happens to be Jewish,” Schultz said. As part of his SXSW visit, Schultz also sat down with Entrepreneurs' Organization Regional Chair David Anderson at an event at Umlauf Sculpture Garden March 9. Schultz discussed some of the key qualities of leadership and building an enduring company are, "trying to build trust and confidence with every constituency, sharing success, [and] recognizing that business is not only about making money." Beth Gendler of National Council of Jewish Women - Minnesota and Nausheena Hussain of Reviving the Islamic Sisterhood for Empowerment sat down for an intimate discussion about how they united to create the Muslim & Jewish Women of Minnesota. The sisterhood brings women together of different faiths to advocate for progressive policy change. The group not only meets to discuss and train for their advocacy platforms, but also for support and comfort in times of tragedy as well as in times of celebration. Gendler and Hussain joked that their gatherings oftentimes involve a shared meal because food unites people. Policy priorities of the sisterhood, Gendler and Hussain explained, include gun violence prevention, ensuring protection and rights for women’s reproductive healthcare and providing accessible healthy and affordable food to everyone. Avi Jorisch, author, entrepreneur and speaker at Shalom Austin’s Jewish Austin Men, shared stories of how innovative projects, inventions and discoveries from Israel have changed the world in the SXSW Interactive session "How Innovation in Israel Makes the World a Better Place" March 10. From water conservation and emergency response improvements, to medical and health treatments, inventors and entrepreneurs in Israel are paving new paths in technology. Jorisch described how a country as small as Israel is able to create all of these new technologies. “It boils down to three secrets. First is the idea of diversity. Israel is one of the most diverse places on the planet." Jorisch continued, "Two, secular institutions. Israel has two secular institutions that have shaped the country fundamentally: the military and its universities." "Lastly, I want to talk about Jewish history, in a very cultural way...The Jewish people have this belief that we’re here to spread morality and social justice,” he said. Speakers from the Abrahamic Reunion —a team of Jewish, Muslim, Christian and Druze religious and spiritual leaders dedicated to uplifting human consciousness and building peace in the Holy Land by opening hearts to the love and wisdom of all spiritual traditions—led the session “Is Peace in the Holy Land Possible?” March 12. The panel included David Less, Abrahamic Reunion co-founder and board chairman; Rev. Anna Less, Abrahamic Reunion executive director; Sheikh Ghassan Manasra, Abrahamic Reunion international director; and Chris Miller, executive administrator for the Abrahamic Reunion, who moderated the panel. Rabbi Yakov Nagen, Abrahamic Reunion Israeli Board co-chair joined the panel from Israel via video. Nagen summed up the group’s message in the beginning of the session. What is needed to work toward peace is grassroots, person to person connection, Nagen explained. Manasra added that misunderstanding of others is further fueling disconnection between people. The panelists discussed the oral traditions that exist in various ethnic cultures in Israel, and the impact personal connection can have in a place where people talk to one another about their experiences. They also discussed the importance of firsthand experience—and ignoring media portrayals—in a country where ethnic groups do not live amongst one another in most towns.